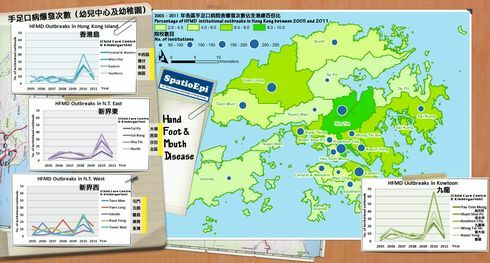 Map shows the distribution of institutional outbreaks of HFMD in Hong Kong over a 7-year period from 2005 to 2011, with graduated colours representing the percentage of the total reports by district. The green circles, varying in size, indicate the total number of institutions in each of the 18 districts. 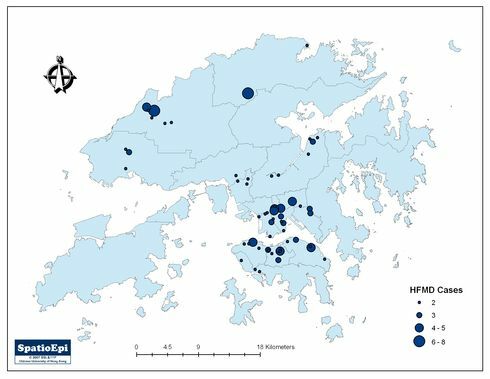 It can be seen that the number of HFMD reported institutional outbreaks in Sha Tin and Kowloon City is significantly higher than other districts. Generally speaking, the greater the number of institutions in a district, the more institutional outbreaks have been reported. The line charts show the yearly number of reported institutional outbreaks from child care centres and kindergartens in four major geographic regions: Hong Kong Island, Kowloon, New Territories East and West. In Southern, Kowloon City, Sha Tin, Yuen Long, Tsuen Wan and Kwai Tsing districts, a sharp peak in 2010 could be seen. In Kowloon City, for example, almost 70 institutional outbreaks had occurred in that year. In New Territories West, Tuen Mun and Yuen Long experienced more institutional outbreaks in 2006 and 2008, a pattern not identical with other districts in the same region. Overall, the temporal patterns of HFMD outbreaks vary by district and region. Data were obtained from the Centre for Health Protection, Department of Health, Hong Kong.